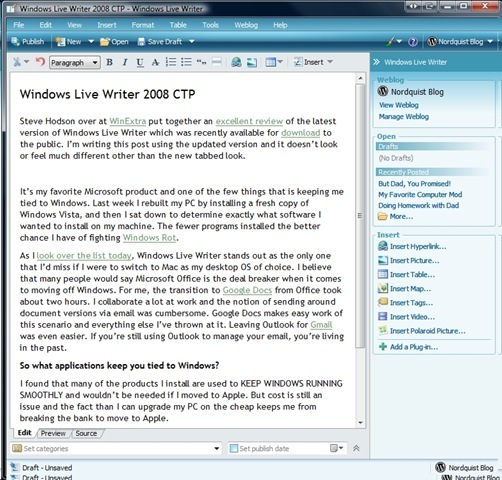 Steve Hodson over at WinExtra put together an excellent review of the latest version of Windows Live Writer which was recently made available for download. I’m writing this post using the updated version and it doesn’t look or feel much different other than the new tabbed look. It’s my favorite Microsoft product and one of the few things that is keeping me tied to Windows. Last week I rebuilt my PC by installing a fresh copy of Windows Vista, and then I sat down to determine exactly what software I wanted to install on my machine. The fewer programs installed the better chance I have of fighting Windows Rot. As I look over the list today, Windows Live Writer stands out as the only one that I’d miss if I were to switch to Mac as my desktop OS of choice. I believe that many people would say Microsoft Office is the deal breaker when it comes to moving off Windows. For me, the transition to Google Docs from Office took about two hours. I collaborate a lot at work and the notion of sending around document versions via email was cumbersome. Google Docs makes easy work of this scenario and everything else I’ve thrown at it. Leaving Outlook for Gmail was even easier. If you’re still using Outlook to manage your email, you’re living in the past. So what applications keep you tied to Windows? I found that many of the products I install are used to KEEP WINDOWS RUNNING SMOOTHLY and wouldn’t be needed if I moved to Apple. But cost is still an issue and the fact than I can upgrade my PC on the cheap keeps me from breaking the bank to move to Apple. Previous Post But Dad, You Promised!